On Mother’s Day weekend in 2018 we launched a wonderful special event that is sure to become one of the most popular events at The Queen Victoria. If you’re looking for an excuse to escape from your normal life for a weekend, what could possibly be better than a weekend in Cape May and an afternoon of chocolate indulgence at The Queen Victoria? 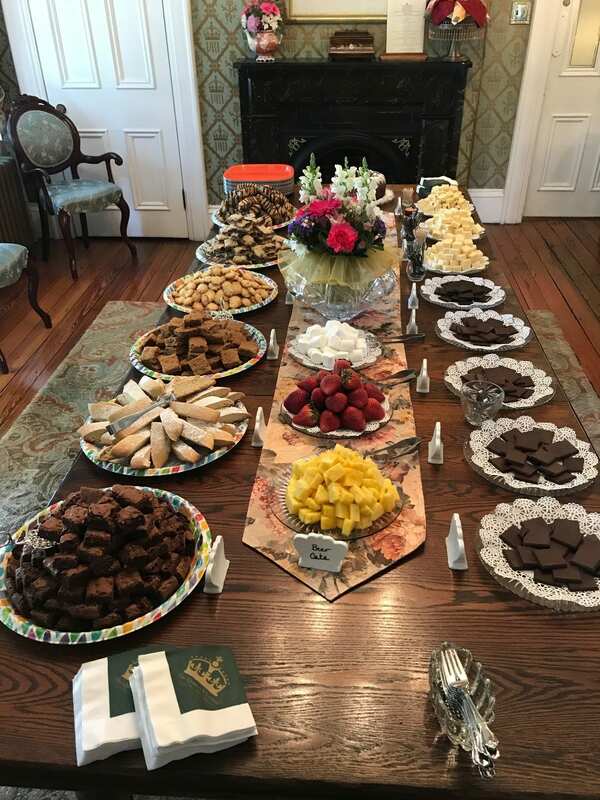 Our Chocolate Lover’s Weekend is the perfect way to spend a couple of days with your favorite person in the world, enjoying Cape May and getting your fill of an amazing buffet of all things chocolate. We’ll be filling our dining room table with a vast variety of chocolate baked goods from our own kitchen, plates filled with exotic specialty chocolates, and fun dipping treats (fruits, cheeses, etc) for you to smother with one or more of our specialty chocolates that you’ll find bubbling away in six different crocks. It is an amazing afternoon that you’ll remember for years to come. We are partnering with Cape May Winery to create a special event/package for true wine lovers. On February 9, 2019, The Queen Victoria® is hosting it annual “Wine Blending Challenge”. On Saturday afternoon, our participating guests will join us at Cape May Winery to craft the perfect blend of red wine. We’ll break up into teams of 4-6 people at a table laden with bottles of the various red wines right out of the barrel and trays of cheese from Seaside Cheese. Each team will craft & document different blends, ranking them among themselves. Once each team has selected its “finest blend”, we’ll all break for a tour of the winery while the winemaker creates the blends we’ve chosen. Following the tour, we head back to the blending room and do a “blind” tasting of the chosen blend of each team. We’ll all vote on the best blend, which will then be bottled for us with a special “Queen Victoria Cellars” label. Each participant will get a bottle of the final blend (2 per couple), the labels of which will be customized with your names and the blending details. This exclusive event is only open to guests of our bed and breakfast and will only occur once this year. Anna Marie and I LOVE this event. I know you will too. Cannot be combined with any other special package promotion. Call us at (609) 884-8702 to reserve. Complimentary cheese tasting party for all registered guests! Our annual Cheese Tasting party is a wonderful event and we’re really looking forward to it again. Anna Marie and I will be filling The Queen Victoria® dining room table with a wide assortment of cheeses from all over the world. There will be about 16 cheeses for us to taste and each one will be labeled with its country origin, how it is made and any other fun tidbits of information we know. We’ll also have breads from one of our local bakeries along with an assortment of specialty olive oils and other tasty goodies. We’re holding this event at our 4:00 Saturday afternoon Tea Time. Now I know that for some people it is impossible to eat cheese without having a glass of wine in your hand, so we’re welcoming everyone to bring their own wine and make an afternoon of it. The wine tends to become communal, so bring something you feel comfortable sharing. The really good news is that this is a free event for all of our guests that weekend. In 2013 we celebrated Anna Marie’s significant birthday (I’ve conveniently forgotten which one) with a party at The Queen Victoria. It was especially fun because we turned it into a “March Birthday” celebration for several of our guests celebrating birthdays that month. They reserved a room for a fun weekend in Cape May and we had a big party for everyone. It was such a great time, in fact, that we’ve decided to repeat and expand the event. In 2019 we’ll be throwing a birthday party every month, January through April, to celebrate the birthdays of any of our guests born in those months. If you’re going to be celebrating a birthday in winter/early spring 2019 and you’re looking for a fun way to do it, I suggest a trip to The Queen Victoria. If you don’t have a birthday coming up, but are looking for an excuse to make a trip to Cape May, you’re welcome too! Book a room and join us, we won’t be checking IDs. Booking Hint: Take advantage of our “Winter Escape” package and give yourself a nice discount for the January, February & March events! Be sure to also view our Cape May vacation packages.